This quality serviced apartment hotel is located in the quiet inner city suburb of Waterloo - about a 20 minute bus ride to the city centre and providing serviced apartment requirements for many of the nearby business parks in Redfern, Surry Hills, Chippendale, Ultimo, Zetland and Moore Park. This fully self contained apartment hotel is nestled above the residential precinct known as Crown Square and is minutes from a range of funky cafes and art galleries that have sprung up in Waterloo. Centennial Park is also a short distance away and features a range of activities from golf to tennis, cycling to horse riding. 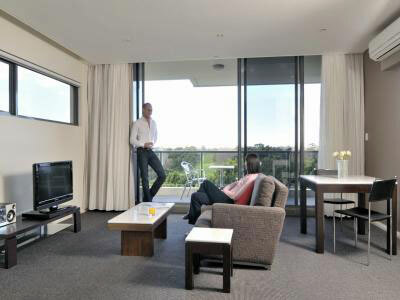 Suitable for both business and leisure travellers, Meriton Dank Street Waterloo Apartments has 184 fully self contained, split level furnished apartments in configurations of one, two, and three bedrooms. 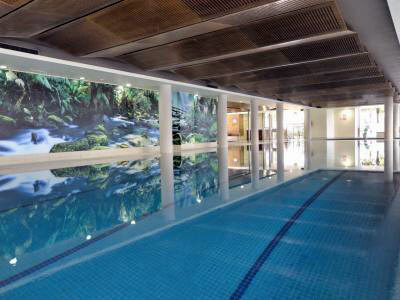 Combining the comforts of an apartment with a range of premier hotel facilities such as a resort style swimming pool, spa, gym and sun baking areas; Meriton Dank Street Waterloo Apartments is a great property to enjoy the best of both of these worlds. 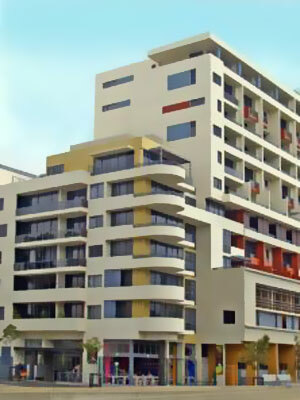 All apartments include fully equipped gourmet kitchen including a full sized fridge and dishwasher, living and dining areas with reverse-cycle individually controlled air-conditioning, separate laundries with washing machines and dryers, opening windows and balcony areas, large screen TV with a DVD player and Foxtel channels, and a work desk and study lamp are also included. There is a personal electronic safe in each room, separate living areas in all rooms except for studios, built in wardrobes, plus a range of complimentary guest amenities. 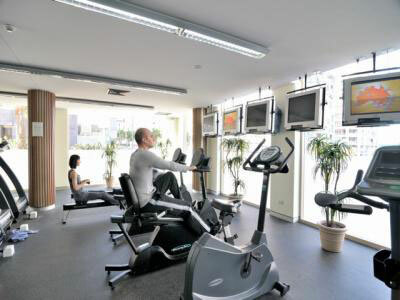 Hotel facilities include the Crown Square Fitness and Crown Square Aquatic Centre featuring three indoor heated pools, sauna, spa, and state of the art gymnasium. This is located a three minute walk within the Crown Square complex and is open daily from 6.00am to 10.00pm. Other hotel services include 24 hour onsite assistance, tour information and city guides, electronic swipe cards for improved security, an onsite supermarket, plus several food and retail stores. A full housekeeping service is done bi weekly with a re-fresh service including all beds made, and towel replacement daily. Undercover parking is available at extra cost. 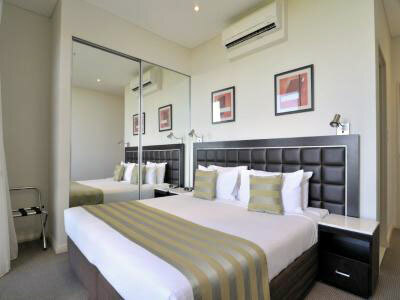 This hotel is a popular accommodation choice for executive travellers needing to be in the inner south east of Sydney as well as those wishing to be accommodated close to the nearby sporting venues. - Configured with King OR 2 King Single Beds. Sofa Bed. - Configured with 2 Kings OR 4 King Single Beds. Sofa Bed. - Configured with 3 Kings OR 6 King Single Beds. Sofa Bed. Directions to parking: Limited under-cover car parking is available for guests at a charge of AUD$25.00 per night/per car; payable direct to reception on arrival. Limited car parking spaces available, spaces cannot be pre-booked or guaranteed. Car parking is on a first come / first parked basis. Spaces cannot be held or reserved. Reception will help, where possible to arrange offsite alternate arrangements if our car park is full. Note: street parking is limited and regularly patrolled. Credit card guarantee at time of booking, with full payment and bond required at check-in. Guaranteeing credit card will not be used as pre-payment.A credit card must be physically presented to reception by the card owner.